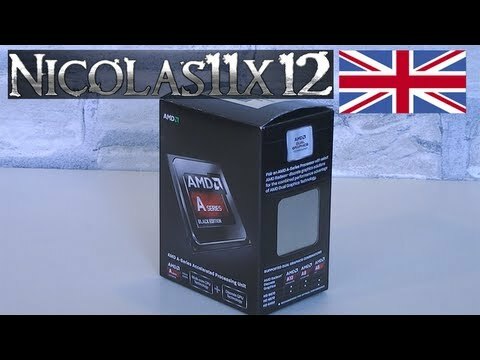 Nicolas11x12 reviewing and benchmarking the new AMD A10-6800K Richland Processor. Did you find this secret message? just did it myself. The catalyst drivers instantly recognize the crossfire option for the APU/GPU, but your mobo has to be set up properly to do so and that's probably what's throwing most users. Can't say the performance increase was noticeable enough to do it, but it's an option with little downside so i did. I'm sure it'd be much better if i just buy a second 7750 and crossfire it, but i know everyone's motherboard doesn't allow that option. the 7950 will not bottleneck with an A10. its no 4770K but it will get the job done. First of all, the graphics performance of the A10-6800k APU flat out dominates the Intel HD Graphics 4600. There is no comparison between Intel IGPU and an APU. Obviously Intel chips beat AMD chips in terms of processing; they always have. That doesn't mean you should undersell the AMD. Intel chips are performing way better today than most people need. You make it sound like this chip isn't good enough. I'm picking one up for $145 WITH a motherboard — brand new — try that with Intel. im not saying the a10 is the only option but is a great option for low budget gamers who want future options. as i said. the A10 will not bottleneck like you said it would. why is my GPU memory size only 512 MB?? That and the fact that he used one of the most Intel biased benchmarks ever. Cinebench 11.5R. I guess also alot of other benchmarks are compiled using intel compiler? Atleast use non biased benchmark testing program if you will get some kind of truth.. Also why wasen't all of the cpu's included in all of the result diagrams? Something to hide? Imo Handbrake would have been a much nicer real world "Benchmark" test.. If anyone wishes to use these APU for good gaming quality,it is absolutely necessary to use the fastest RAM available. I have a doubt and you might be the right person to ask because I was considering the possibility of the A10 6800K bottlenecking any HD79XX and since you used a HD7970 in your test rig, tell me, does it really bottlenecks? i like this a10 apu because of power consumption. imagine 100w for both cpu and gpu. Says recommended for performance, dousnt say you can only use them cards with it. so the first games benchmarks you did were with the apu by itself or with a descrete gpu? why my GPU mem size is 768mb only? does it make a difference in fps if i use this kind of set up. Any chance you can do crossfire on this thing with integrated graphics on the mainboard? I7 4770 or amd a 10 6800?????? is best cpu for me ,i like! I like the 6800k, I'm going to be using my GT 640 with it though, I don't like the IGP. How much Gb is the is the video chip? don't forget buy DVI or HDMI cable to enjoy the quality ! REPLY! Can I put a 750 ti along with this CPU? Can I pair this with a GTX 750? What I mean is – Would this cpu be a good setup with 8gb of ram and a GTX 750? With this chip and a sapphire r9 270x or r9 280/x,8gb RAM will i be able to run games like watch dogs,assasins creed gta…with medium to high settings?thanks! Was this the last FM2 APU? My mobo is only FM2 (not +), and I am thinking of upgrading from my 5800k. I know the improvement will only be marginal, but I want to get the best from my motherboard as I can (I have windows OEM, so when I do upgrade, I'll not only need to pay for the new board, but I'll also need Windows). This apu with sapphire r9 270x OC dual x edition would be a good match? can i play Bf3 or B4 ultra settings? 1080p?